Welcome to Question Corner with Teacher & Gordo. In these posts, you will learn useful information regarding CodeMonkey’s different content and courses. Each post will include questions from Teacher with answers from Gordo, CodeMonkey’s smartest friend. CodeMonkey’s latest course teaches Python, but are you ready to teach it? In today’s Question Corner Segment, you will learn if Coding Chatbots is right for you. Hi Gordo, I heard about Coding Chatbots, CodeMonkey’s first Python course. I was wondering if I am ready to introduce it to my class. That is a great idea but it really depends on how experienced you are in Computer Science. Unlike CodeMonkey’s previous courses, Coding Chatbots is for more advanced users. I took a CS course in college and taught Coding Adventure to my 4th graders but that’s pretty much it. Hmm, that may be enough experience, but since Coding Chatbots introduces more advanced coding concepts, we recommend that teachers are familiar with Python prior to teaching it in the classroom. Students, on the other hand, do not need experience in coding prior to the course.So, make sure you are familiar with the following concepts before starting the course. If you are familiar with these concepts, you are ready to bring Coding Chatbots to the classroom. Sure! The course lets you teach CS concepts in Python. The students practice each new concept, by using it, to add new abilities to the Chatbot they write. Along with the new concepts, they learn to write quality or maintainable code, that can pass code review in real work environment. It really is. At the end of the course, they will also be able to play a popular guessing game with a chatbot that they created! 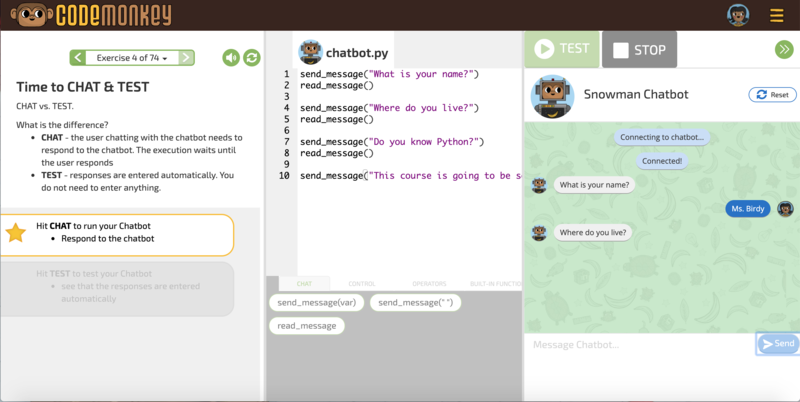 There are a bunch of really cool activities in the lesson plans (coming out shortly) that you can do in class to demonstrate a chatbot interface, variables, conditions and more. Awesome, I’ll try it out. Anymore questions about Coding Chatbots? Feel free to ask in the comments section below or visit Coding Chatbots. Can’t wait to try with my 8th graders in a couple weeks!